House Cleaning Maintenance – our “Standard Clean” – is used to maintain the cleanliness of your home. It is our most common cleaning service for residential clients on a consistent cleaning schedule. It includes kitchen and bathroom cleaning, living room & dining rooms, dusting & floor cleaning. Call or email to receive an itemized list of what our Standard Clean program includes. Bring your home back to a maintained condition with our “Deep Clean”. Our Deep Clean is the initial cleaning service, before moving into a Standard Clean maintenance program. It can also be scheduled as a one time service (think: Spring cleaning or pre-holiday cleaning!). 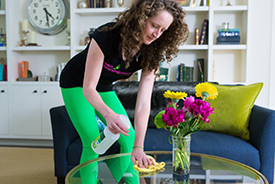 Has it been too long since your home or office has been on a consistent cleaning program? Is soap scum building up in your shower? Are dust bunnies and pet hair taking over? We suggest our Deep Clean to bring your home up to a throughly maintained condition. Do you have a second residence or Vacation Rental location that you need to frequently flip over for the next renter? Our Vacation Rental Service is similar to our Move-in/Move-out Clean but it is catered to VRBO and AirBnB hosts that also need cleanings between guests. Services include linens change/replace, towel change/replace, emptying of the fridge/freezer, toilet paper restocked, etc. If you have an office or commercial location, our “Office Cleaning Service” is probably what you are looking for (we may also suggest an initial Deep Clean). Our Office Cleaning Service is suited for building owners/renters and property managers. Our standard service includes bathrooms, kitchen(s), floors, windows, trash & recycling. We service: health care facilities, retail establishments, corporate offices, and schools. Call or email for details and/or to set up a walk-through and proposal quote. Want to add, say, laundry or interior windows to one of our standard services? Our “Eco-Maid Services” can “add on” services to fit your needs. Whether you want us to fold your laundry or sweep your patios, we offer a wide variety of housekeeping services. Call or email for a consultation and free estimate on our Eco-Maid Services.